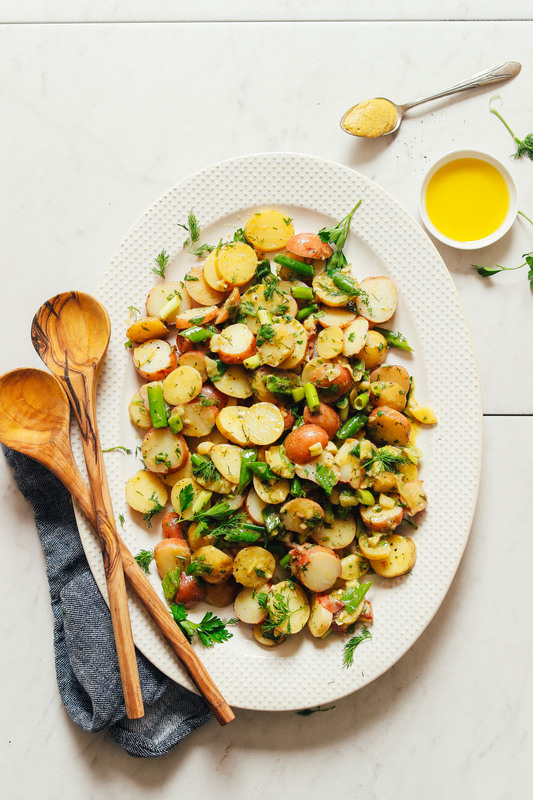 This simple potato salad is inspired by one we tried while in Austin. The potato salads I’m used to having are typically dressed with a mayo sauce, making them thicker and more indulgent. But I loved the tangy, light quality of a potato salad dressed in an herb-infused vinaigrette instead. I later discovered that this is more of a French style of preparing potato salad. I hope you enjoy this inspired version that’s perfect for summer BBQs, lazy picnics, road trips, and more. This 10-ingredient, 30-minute recipe starts with thinly sliced baby potatoes (we enjoyed a mix of gold and red) boiled until just tender. They’re then seasoned with salt, pepper, and a dash of apple cider vinegar for a layer of flavor. The dressing is a simple garlicky mustard vinaigrette with both red wine vinegar and apple cider vinegar. We found that the combination of these two provide the perfect amount and quality of acidity. Fresh herbs add even more earthy flavor, while olive oil helps create a creamy texture. Swoon. Once the dressing is prepared, all that’s left to do is add fresh chopped herbs and green onion to the boiled potatoes and combine. This potato salad can be enjoyed warm, at room temperature, and even chilled – our favorite being room temperature. This would make the perfect side to go alongside grill-friendly dishes like Smoky BBQ Black Bean Burgers, Jerk-Style Grilled Eggplant, and Grilled Veggie Skewers. It would also pair well with our Vegan ‘Pulled Pork’ Sandwich, Grilled Corn with Sriracha Aioli, and Garlicky Kale Salad with Crispy Chickpeas. Into potato salad? Be sure to check our Classic Simple Vegan Potato Salad, Butternut Squash Potato Salad, as well as our Sweet Potato Avocado Salad and Sweet Potato Chickpea Salad. 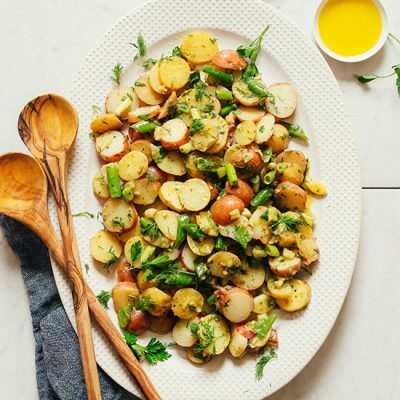 A simple take on potato salad with fresh herbs, onion, and a light mustard vinaigrette. The perfect plant-based side for cookouts, sandwiches, and more! Rinse and scrub potatoes, then slice into 1/4-inch slices. Add to a large saucepan and cover with water. Add a healthy dash of salt (for flavor) and bring to a boil. 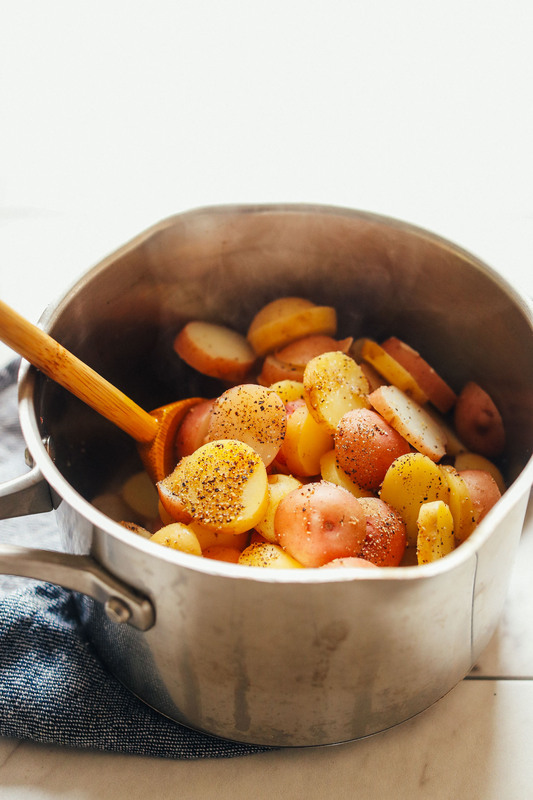 Once boiling, reduce heat slightly (to medium/high) and continue cooking for 10-15 minutes or until the potatoes are easily pierced with a knife and also easily slide off the knife. Be sure not to undercook the potatoes or they can be waxy and difficult to eat. When in doubt, carefully scoop out a potato and test it to see if it’s the right doneness. Once the potatoes have finished cooking, drain and rinse with cool water. Then once mostly dry, add to a large serving bowl. Season with a dash of salt and black pepper and apple cider vinegar. Set aside. While potatoes are cooking, prepare dressing. 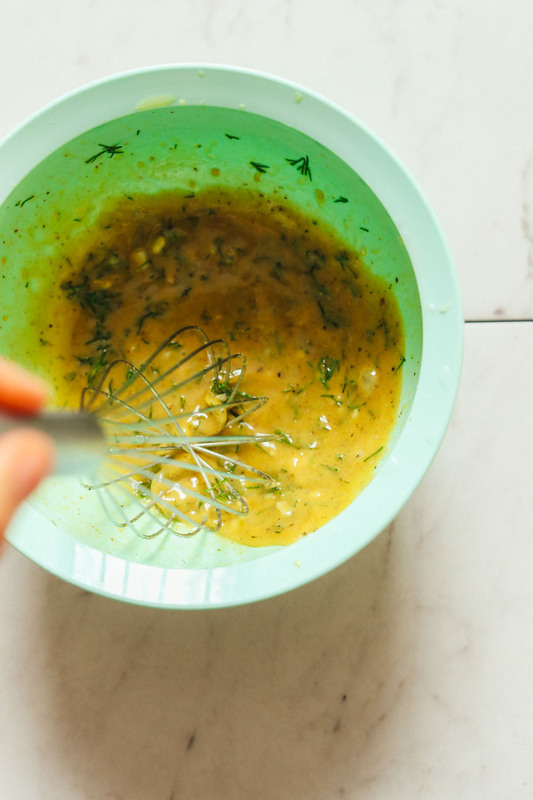 Add mustard, garlic, salt, pepper, red wine vinegar, and apple cider vinegar to a mixing bowl and whisk to combine. Then, while continuing to whisk, slowly stream in the olive oil to emulsify the oil and vinegar. Add the dill and whisk once more. Taste and adjust flavor as needed, adding more salt for saltiness, black pepper for spice, mustard for intense mustard flavor, vinegar for more acidity, or dill for herbal flavor. Add the dressing to the potatoes along with the green onion and parsley (optional), and toss to combine. Taste the potato salad and adjust salt and pepper again (we added a bit more of each). It’s now ready to enjoy, but it also soaks in more of the flavor of the dressing the longer it sits. Serve warm, chilled, or room temperature. Store leftovers covered in the refrigerator up to 4 days. Not freezer friendly. 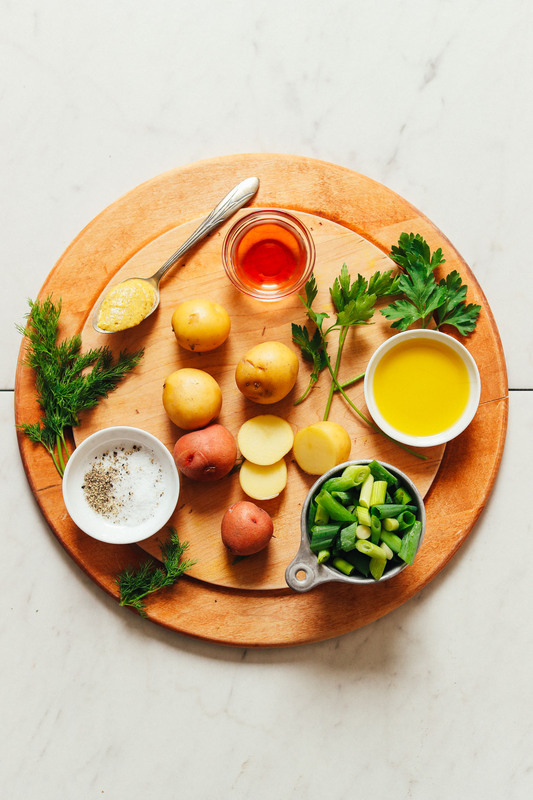 *If avoiding oil, try this dressing recipe instead and omit the 1 Tbsp oil! *Recipe as written makes approximately 7 cups potato salad. I don’t apple cider vinegar, can I reduce it? We haven’t tried it without the apple cider vinegar, but would recommend substituting it with more red wine vinegar rather than omitting. Hope that helps! I made this dish today. I am eating it a 4 because I found it too tangy for my palate. Is there anyway that one can cut down on this either by omitting one of the vinegar of adding sugar to the dressing? Hi June! Next time, I’d recommend trying half the dark mustard and half either regular dijon or honey mustard just to cut it a bit. Hope this helps! I made this recipe with thinly sliced leeks instead of green onions to make it similar to my girlfriend’s Swedish mother’s recipe. Once it sits for a little bit the leeks start to pickle in the vinegar and are delicious. A little bit better than green onions in my opinion because after a day or two in the fridge they maintain a better snap. Yum! Thanks for sharing, Bernard! This turned out fantastic! Made as written and loved the tangy taste and big flavor. I made this for guests last night and it was a big hit! Already thinking about making it again. Whoop! We are glad it was a hit, Jocelyn! I made this recipe this week for my lunch and it was delicious! To make it stand alone, I cooked 1 cup of dry lentils (about 2 cups cooked) in my rice cooker and made a little extra dressing, then tossed that into bowl with the potatoes. I added some chives in the mixture. I also served it over lactino kale and tomatoes. Delicious and I will totally repeat! Smart! Thanks for sharing, Savannah! 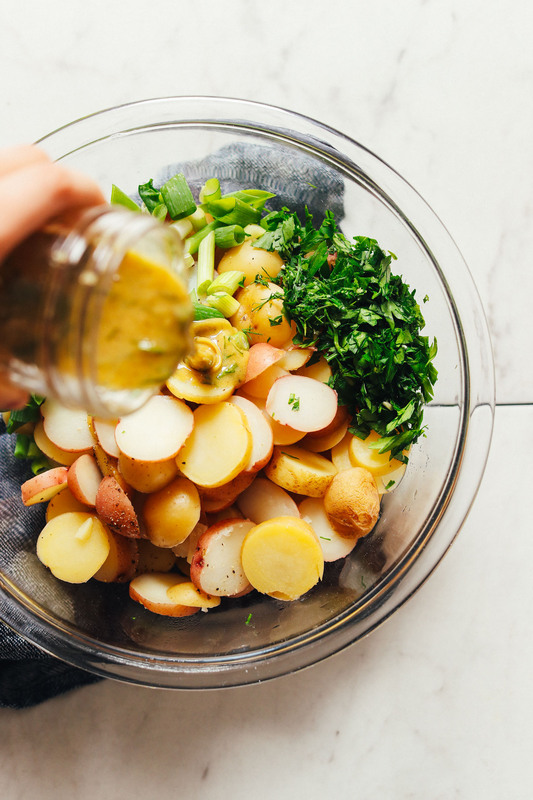 My family isn’t that big on potatoes, particularly traditional potato salad- as we’re all mayonnaise haters, but we had a big buffet style party coming up so decided to road test this recipe to see if it would fit the bill. OMG I am a convert. I ate these potatoes for lunch and supper 3 days in a row, we had actual fights over the last potato. Dana you’ve a genius, thank you again, yet another one of your recipes has become an instant hit in my household!! Yay! We are so glad you enjoyed this recipe! Made this tonight with roasted potatoes instead of boiled. It was delicious! Glad to hear it, Amy! We download our songs from a licensed music website! I made this for the first time for my works potluck luncheon and it was a hit. Whoop! Glad to hear it, Christy! Great light and refreshing salad – I agree it is tangy but the best tangy! With small potatoes i like to steam them whole- the flavor of the potato is more intense that way and it doesn’t take much longer than boiling. Then after slicing i sprinkle with the vinegar so that soaks into the warm potato. I bet this will be great as a warm dish this fall- i always love mustardy salads with lots of dill! Loved this! Dressing is great and I liked cutting the potato on the diagonal and not in chunks like I usually do. I had green pole beans in the garden and added them in abundance to make the salad larger. Thanks for another terrific recipe. This was a great, refreshing alternative to a heavy mayonnaise-based potato salad. I made it for a BBQ with a few friends that are vegan and everyone loved it! I forgot fresh dill so used 1/2 the amount of dried dill and it was still great. I also skipped the parsley. I will definitely make again in the future, and with fresh herbs this time! Excellent summertime recipe! The fresh dill, green onion and parsley give this a wonderful flavor. The only thing I did differently was I used champagne vinegar instead of the red wine (or white wine) vinegar in the dressing. Super YUMMY! We are glad to hear that you enjoyed it! Made this last night and loved it! I didn’t find the mustard taste overwhelming at all. I also added steamed green beans, a can of rinsed lentils and served over a plate of greens. Delish! I made this for a large crowd. They loved the lightness of the salad–not gummed up by mayo. When non-vegans love it–you know you have a winner. And it’s easy! Well done, Dana! Yay! I love the lightness too! Glad everyone enjoyed it, Judy. I am making this today but had printed it out on August 18. I noticed it didn’t say how the potatoes were to be prepared before cooking. Came back here today to see if you had edited it and I see you have! Thank you. This salad is tangy. I think next time I might try half the dark mustard and half either regular dijon or honey mustard just to cut it a bit. I used Maille Old Style mustard. I loved it! So easy and quick and my kids loved it, which is like a Christmas miracle. Thank you!! Yay! Thanks for sharing, Jenny! So I love potatoes and don’t like traditional potato salad. This looks more to my liking, but I absolutely hate mustard. I know it’s not a huge amount of mustard, but I would definitely taste it. Do you have any suggestions for a dressing without mustard? I would just leave it our or sub tahini! What is the serving size? Is it 1/2 cup? Yes. You can find the serving sizes in the recipe box and just under the Prep time / Cook time. 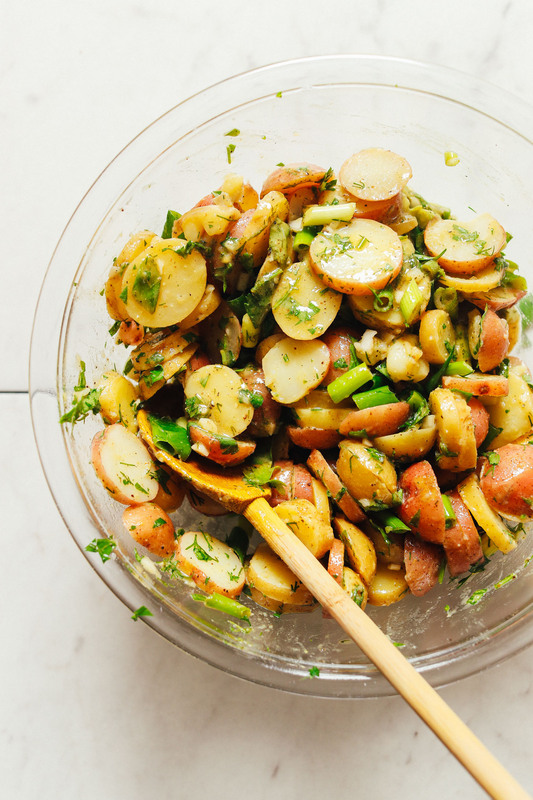 I’ve only had potato salads a few times in my life, but they are definitely delicious! Onions and potatoes pair beautifully together. 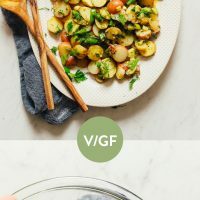 Purple potatoes probably taste amazing in this salad too–I want to try making this salad with them! I cooked my potatoes whole and then cut them when they cooled a bit. It worked fine. Pretty tangy but good! Amazing! I didn’t have fresh dill so added some dry and it still came out amazing! Can’t stop picking at it. May not be any left for supper! Bet it will be even better with fresh dill though. This sounds tasty. Will add to my “try some day” list. I don’t see in the instructions or the recipe whether the potatoes are cooked whole or sliced. I see in the demo video that they are cooked sliced, which makes sense. Recommend you add that adjective to the first step in the instructions. The introduction mentions thinly-sliced potatoes but the recipe does not. The time given sounds like the amount required for whole baby potatoes. But it seems like slicing the raw potatoes would be easier than waiting until they were cooked. I just watched the little video because I couldn’t find the answer either…looks like they are pre cut before cooking. This recipe came out amazing..so delicious and flavorful…bringing it to a potluck tonight! Also..I used fingerlings that had just been dug a day or so ago. YUM! Thanks for sharing! I’ll add some clarification there! I haven’t tried this one yet but will definitely do so. I love your recipes, especially the avocado green smoothie and the aquafaba granola. Thanks so much for helping to eat delicious, healthy foods! Making this tonight with Beyond Burgers and grilled romaine (if I can find it). Okay, you want to cook the potatoes whole, so that they don’t become mash. When just done, remove them from the heat, drain and let them cool. That’s why you use small potatoes here, so that we’re not dealing in hours. You don’t want them cold, just cool enough that you can comfortably slice them.